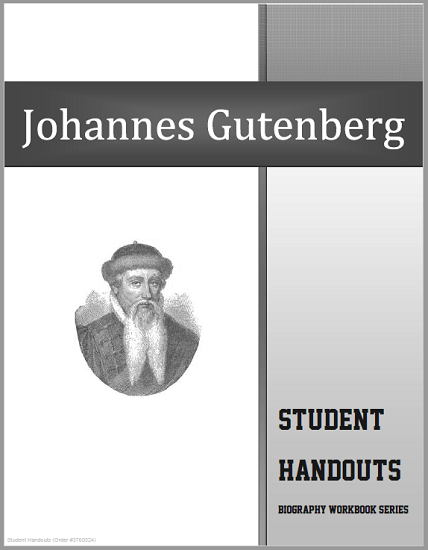 Johannes Gutenberg (1398-1468): Learn all about the famous inventor of the printing press with movable type. Gutenberg's invention paved the way for mass literacy, as well as the promulgation of the ideas of the Renaissance and the Enlightenment. Not until the invention of the Internet and Computer Revolution of today did anything in modern human history have such a deep and lasting impact on the spread and growth of human knowledge. Designed for high school students of World History and European History, this twenty-page workbook is full of engaging questions and activities. Click here to print. 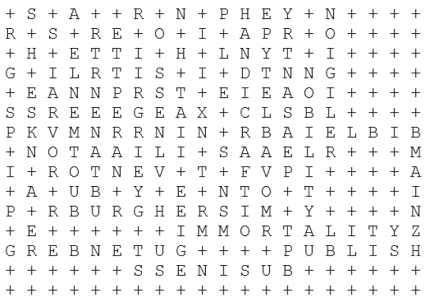 The answer key is below. Check out other titles in our Biography Workbooks series. Answer Key - 1. C - tyranny; 2. D - restrained; 3. A - kingdom; 4. B - condemned; 5. The wealthy classes--nobles, burgesses (burghers), and artisans; 6. C - nobility; 7. A - antagonism; 8. A - arbiter; 9. D - provisions; 10. Answers will vary; 11. B - inheritance; 12. Gutenberg's friends held the chief magistrate of Mainz for ransom; 13. A - Greece; 14. C - keenness; 15. B - expunged; 16. A Latin grammar engraved on a wooden board; 17. Answers will vary, but will include the discovery of letters reproduced on cloth in sap from freshly carved wood; 18. B - inadvertently; 19. C - Strasburg; 20. D - personified; 21. B - False; 22. A - Faustus; 23. Answers will vary; 24. D - smooth; 25. Convent of St. Arbogast; 26. Conrad Saspach; 27. D - religious; 28. A - diverse; 29. B - profitable; 30. B - disadvantageous; 31. C - questioning; 32. A - deceitful; 33. He preferred to lose his court case if it meant keeping the secrets of the printing press to himself; 34. Peter Schoeffer; 35. 1457; 36. A - adjutant; 37. B - False; 38. Emperor Maximilian; 39. Adolphus, Elector of Nassau; 40. B - assuagement; 41. C - transmitting; 42. Answers will vary; 43. G - disadvantageous; 44. B - antagonism; 45. A - adjutant; 46. T - transmitting; 47. D - assuagement; 48. U - tyranny; 49. I - expunged; 50. L - keenness; 51. N - personified; 52. Q - questioning; 53. F - deceitful; 54. C - arbiter; 55. H - diverse; 56. S - smooth; 57. K - inheritance; 58. E - condemned; 59. P - provisions; 60. O - profitable; 61. R - restrained; 62. M - kingdom; 63. J - inadvertently.